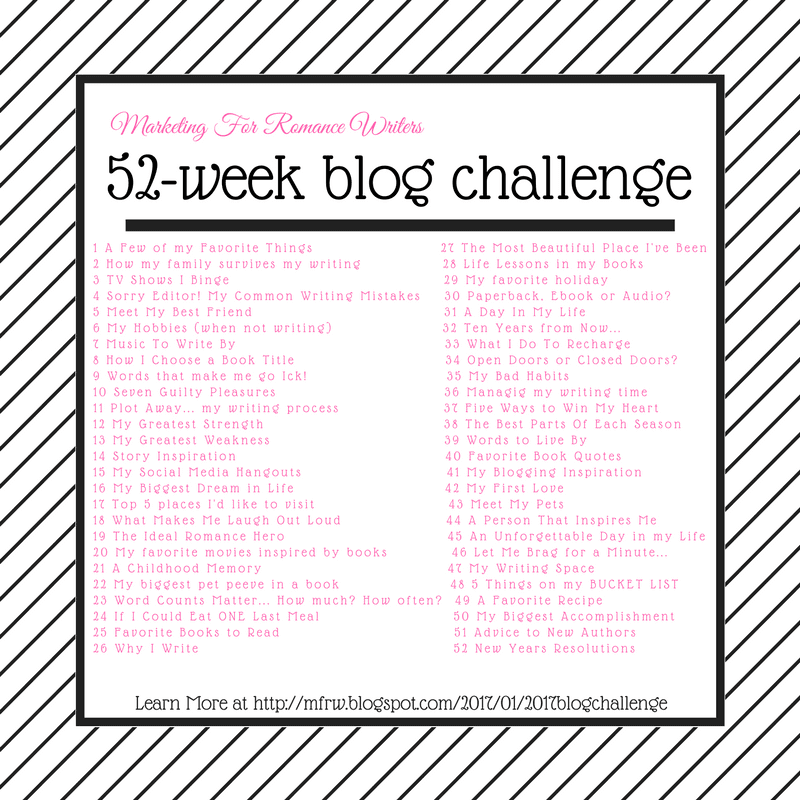 Welcome back to week 23 of the 52 week blog challenge. (Say that three times real fast LOL) If you wonder what this is you can get details here. This weeks topic is Word Counts Matter…How Much? How Often? This one I am very anxious to see what the more experience writers say. I think I may be the only one without a book out (unless you count my children’s book). I will admit that the only manuscripts I have finished or nearly finished are the 4 I have done in the November NaNo competitions. In November a bunch of us set goals to write a 50k manuscript in 30 days. That is 1667 words a day for 30 days. I have managed all but one year that I have done this. So I guess that means it does work for me. The issue is the quality of the words are so bad it takes me half a year to clean it up. After one rewrite I tend to file the project away and there they sit. I tried setting the goal of 2000 words a day which I know is very doable since I did between 1600 and 2000 every November. For some reason I tend to sit and stare ate the word counter. I feel like the count on Sesame Street. One word. Ah HA ha ha! 50 words Ah ha ha ha! I’ve set smaller goals still doesn’t work for me. I feel so overwhelmed. Then if I don’t make my word count I get upset with myself. I have even sunk into depression over it. I have one of those personalities LOL. I found that it is best for me to eat the Elephant differently. Sprints work for me. Telling myself to sit at the computer and write on that manuscript everyday whether it is 1 hour or 5 minutes. Right now I am getting back in my saddle from a long period of depression and being overwhelmed. It is better I don’t set big goals or deadlines at this time. I need to get back into the daily habit of writing at all. This blog challenge has helped alot. I know once a week I have to sit down and type. I have no word goals. I write as little or lot as I need. I do envy the authors that can sit and write 3000 or more words a day. Or write a manuscript in 30 days get a book out in about 90. I hope someday that will be me too. I have a few more things n my life to take care of but soon I hope to get back to daily writing.. I am going to start with an hour and as many words as I can fit in that hour. If I am still going after that good for me. I do plan to do NaNo again this November so that will be a definite 50k in 30 days. How many words do you write a day? What is your method? Any suggestions for me? Let’s go see how the other authors handle word count. Depression is a problem for a lot of creative types, and it can certainly back you into a corner at times. I used to set firm word counts and write 7 days a week no matter what. They I had some depression issues of my own, and my daughter suffered severe depression and attempted to take her own life, and I couldn’t write at all for a couple of years. As I came back to writing, I would set goals for myself that may seem ridiculous to some: “Sit down at the computer and open the document” or “Type one word,” so I totally understand what you’re saying! For the past few years, I’ve “required” one hour a day of myself, and am only now to the point where I can add “before you do anything else” to my writing goals. Be kind to yourself. Figure out what works for you. Do that. That is amazing advice sorry about your daughter I hope she is better now! Not making the goals you set for yourself can eat away at you. I’ve had a few that have long since passed for my WIP and each time it did I disliked myself for not meeting it. Setting a goal to write daily is something I talk about in my post today. Not a lot of words, just words. It’s helped. Smaller goals are more manageable for me. Congrats on completing NaNo so many times! I’m attempting for the first time this year so we’ll see how that goes. I have struggled so much with this same thing. I like what Sherry said above “before you do anything else.” With my Quantum 4–1st rough draft, stationary bike, mindset, and low carb– first thing in the morning for the first 2 things is vital for my well being. Days often bring unexpected surprises, such as needing to pick up the boys early or the electricity goes out. If I have the writing and bicycling done first thing by 1pm, I don’t get stressed out and frustrated. What a relief. I have also found that, for me, i especially need to avoid social media and email until the writing and bicycling are done. Otherwise I get pulled in and viola– 30 minutes is wasted. Another piece of gold I recently put into action is the power of free 15 minutes throughout the day. So much can get done in that amount of time! I’m so glad you are feeling better and getting on your own track. Well done. Thank You and your Quantum 4 post helped me a great deal! I have struggled so much with this same thing. I like what Sherry said above “before you do anything else.” With my Quantum 4–1st rough draft, stationary bike, mindset, and low carb– doing the first two priorities first thing in the morning is vital for my well being. Days often bring unexpected surprises, such as needing to pick up the boys early or the electricity goes out. If I have the writing and bicycling done by 1pm, I don’t get stressed out and frustrated. What a relief. I have also found that, for me, i especially need to avoid social media and email until the writing and bicycling are done. Otherwise I get pulled in and viola– 30 minutes is wasted. Another piece of gold I recently put into action is the power of free 15 minutes throughout the day. So much can get done in that amount of time! It’s a back and forth struggle, and we are so glad when we make some headway. I’m glad you are feeling better and getting on your own track. Well done. Cathy, I keep trying to comment but it’s not working. Sad me. your comment did come through thank you! Many is the time I’ve wished I could write faster! Oh, to be one of those people who dash off a bestseller in a month! Of course, I’d also like to win the lottery. I haven’t and won’t (because I’ve stopped buying tickets), and I won’t write a book in a month, either. I stuck with kinda plodding along, but if you plod long enough, sometimes you’ll beat the lightning fast hare. If you’re doing the best you can, then you’re doing the best you can, right? I haven’t written in awhile, due to “life happens”, but when I do write, I tell myself I just need to write for a half hour or an hour. That way, I get something on paper and I can feel good about moving on, but I’m not making myself miserable. Depression is a tough thing to combat – take care of yourself FIRST, the rest will fall into place as you heal. Thank you! I learned so much and got so much help from this post. I now am going to start small and just write. I’m a slow writer, also, darn it. And my manuscripts always require a lot of polishing. I no longer feel alone or like a failure after this post LOl Now I am ready to try again.